*Note: You can also use fresh wild blueberries here if you can find them and they’re not crazy expensive. You can also use normal (not wild) blueberries if you can’t find wild ones. But if you have the option, do pick up the wild berries for this pie, the flavor of the tiny, wild berries is so much more intense than that of it’s big brother. It is best if the ingredients and the bowl for this are cold. I would suggest putting all the ingredients in the freezer for 10 to 15 minutes before you start. To get the water cold enough, place a larger quantity of water than needed in a measuring cup and add ice. When it comes time to add the water, measure out the amount by dipping a tablespoon into the measuring cup and pouring the amount into the bowl. In a large bowl mix the flour and the salt with a fork until well combined. Cut the shortening into the flour mixture with either a pastry blender, two knives, or a fork. The mixture should look like course crumbs when you are done with this step. Add the water and quickly stir together the dough with a fork. It should come together in larger and larger clumps until you have a ball of dough in the bowl. Turn the dough out on to the work surface and shape into a ball. Be sure not to work the dough too much. Do this in as few moves as possible. Cut the dough in half. Place one half back into the bowl and cover with plastic wrap and place in the fridge. With the remaining half of the dough, flour the board, and shape this back into a ball. Flatten into a disc about 1 inch thick and using a rolling pin, roll out the pie crust. Try to keep the shape as circular as you can. Roll out until the dough is about 1 to 1 1/2 inches larger than the outer edge of your pie pan. Remove your pie pan and place is right side up next to your work area. Remove the scraps and roll the large circle of pie crust dough on to the rolling pin. Then, unroll the dough over the pie pan. Press the dough down into the corners of your pan and set aside. In a medium bowl, combine the frozen blueberries and sugar. Gently mix this well, tossing with a spoon or your hands. Add the flour and toss to coat. Add the lemon zest and juice and mix one more time, gently tossing the ingredients until everything is well coated. Pour this filling into crust-lined pie pan. Roll out the second half of the dough the same way you did before. You can either place this on top of the pie, doing a normal top crust or you can do a lattice crust on top (details on this later). If you choose not to do a lattice crust, be sure to pierce several holes in the top so that the steam from the cooking berries can escape. 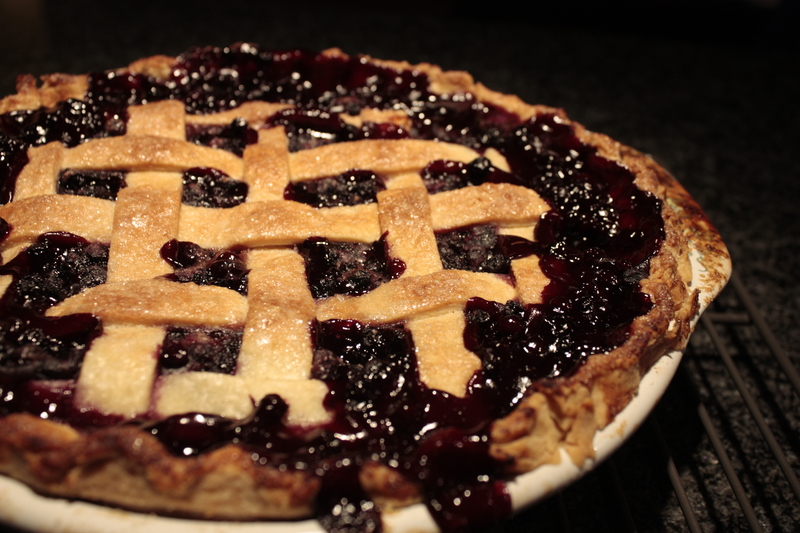 Trim any excess crust from the edge of the pie pan using a sharp knife. Crimp the edges in a decorative pattern using your thumbs and forefinger or by pressing a the tines of a fork on the edge of the pan in a criss-cross pattern (much like you would for a peanut butter cookie). The soy milk makes the crust shiny and the sugar makes it glittery. I’m a fan of this look on my pie crusts. Using a pastry brush, brush the soy milk over the crust. Place the pie in the oven. Place a sheet of aluminum foil on a baking pan and place this on the rack below your pie to catch drips. (If you only have one rack, you can place this directly under the pie pan.) Pie filling almost always overflows and this one is quite sticky. Save yourself the cleanup and burning pie filling smell by doing this in advance. If using frozen blueberries, bake for 1 hour 20 minutes to 1 hour 30 minutes. If using fresh berries, bake for 40 to 55 minutes. If the crust on the edges browns too quickly, loosely cover just the crust edges with aluminum foil for the remainder of baking.